Building extraction has been a challenging task due to complex structures and features of various land use with matching spectral and spatial attributes in a satellite data. We attempted to extract building as features using machine-learning algorithms such as Support Vector Machine (SVM), Random Forests (RF), Artificial Neural Network (ANN) and Improved Ensemble Technique as Gradient Boosting. The techniques used increases their classification accuracies using spectral properties as well as indices such as Normalized Difference Vegetation Index (NDVI) as attributes. Extracted results through various methods, performance of three different machine learning such as Ensemble method, RF and SVM are applied and results are analyzed for their behavior in different building distribution. Different algorithms showed variations in accuracies and performance in different built-up conditions. Ensemble algorithm performed very well in all conditions followed by RF and SVM performed better in coarse resolution, while ANN performed better in high resolution and overall accuracies of all algorithms increased with better spatial resolution. Ensemble algorithm showed relatively efficient performance in regions with extensive heterogeneous features. These analyses can helpful to provide quantitative data for various stocktaking analysis and city managers for better administration capabilities. 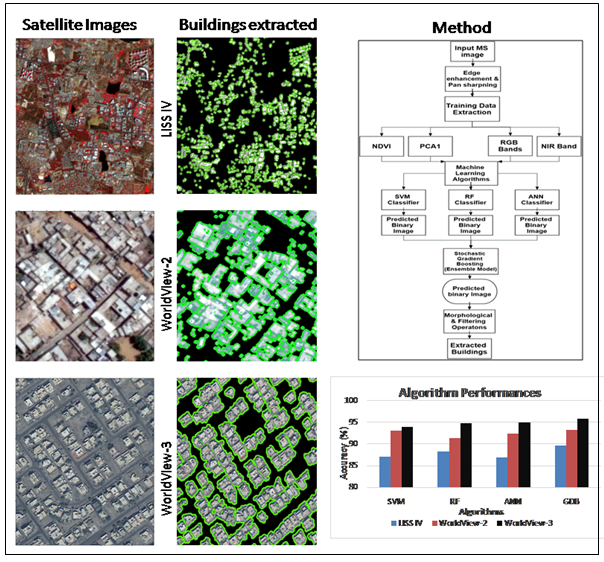 The paper evaluates spatial resolutions of RS data and machine learning algorithms for automated building extractions. Different algorithms showed variations in accuracies and performance in different built-up conditions. Building extraction through ensemble learning improves through gradient boosting. The findings and methodology can be helpful in better administration capabilities.